RM-4C8-HDE1 Reference Monitor With RM-HDE1 Dolby Decoder Card. This version of the Reference Monitor is the RM-4C8 with the RM-HDE1 expansion card already fitted. So, it has all of the features of the RM-4C8 as standard together with the ability to de-embed audio from an SDI stream and then decode a Dolby digital audio signal from that de-embedded audio. The RM-HDE1 adds to the unit a 75ohm 3G/HD/SD-SDI input and output on BNC connectors with the output acting as a loop-through of the input. The monitor can take a 3G/HD/SD-SDI input and de-embed audio from any selected audio group, with left and right speakers being able to monitor any 2 channels within that group. The 4 channels in a group are shown on the 4 bar-graph meters. 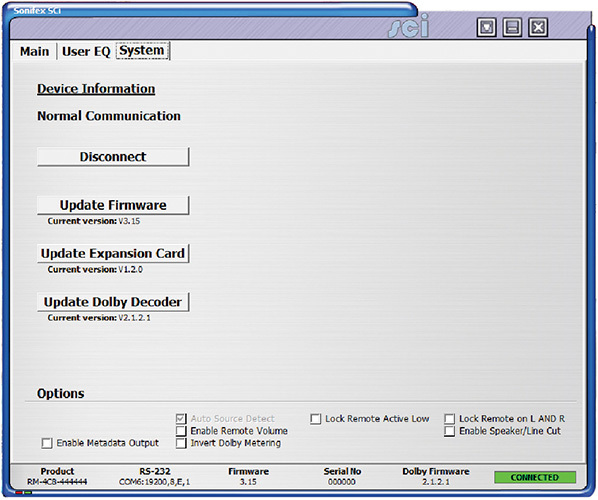 If a Dolby E or Dolby Digital input is detected on the selected input, the Channels (CHANS) button flashes to indicate that decoding is possible. Pressing the CHANS button displays the Dolby Digital 5.1 or Dolby E 8 channel signal, using the 4 bar-graph meters. Each meter is split into 2 sections allowing you to view L, R, C, LFE, Ls, Rs for Dolby Digital and an additional Lt, Rt for Dolby E.
Full Dolby Metadata is available using the SCi remote control software. For a more detailed description of Dolby Decoding operation please refer to the Reference Monitor handbook. With full remote control via GPI, RS232 or USB, a 5 band parametric equaliser, 6 front panel modifier buttons and the ability to take the optional 3G/HD/SD-SDI expansion cards, the RM-4C8 is a flexible and versatile monitoring solution. The same high level of care has been taken in the design of the RM-4C8 as in the RM-2S4 to ensure that it will be the best sounding 1U rack-mount audio monitor that you listen to.